My poem “Bless Me Editor” from Rattle’s previous print issue went up on their website today, including a somewhat manic audio recording. I think it’s a wild ride through my psyche, and I hope you enjoy it! This entry was posted in Uncategorized on March 8, 2018 by rplatypus. Another music video from my latest trip to Dar es Salaam. This one is a collaboration with my friends Man Dili and Melali Juma in the mchiriku style endemic to Dar and its surrounding areas. It’s called “Harakati” (or “Activism”). I hope you enjoy! This entry was posted in Uncategorized on January 9, 2018 by rplatypus. This website mostly serves as an archive of my publications for the handful of people out there who might stumble across a poem of mine and be curious enough to google me. As such, my posts here are rote, sporadic, and often unenthusiastic links to those publications that happen to appear online. But last week, along with dozens of activists from the direct action group Rise and Resist, I participated in a pro-immigration civil disobedience action that I thought I would share. In the lobby of Trump Tower, we dropped three banners stating, respectively, “NO BAN” “NO WALL” and “NO RAIDS”. 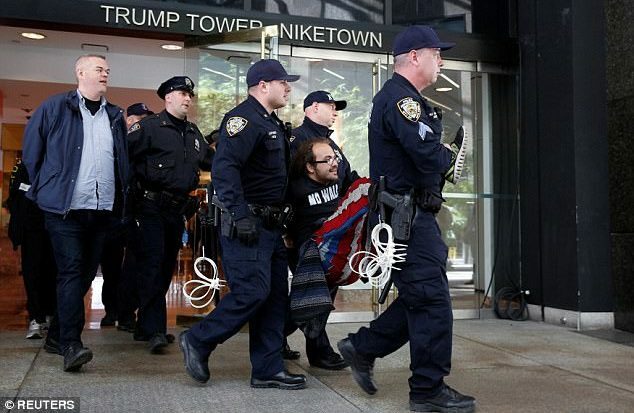 Trump Security proceeded to shut down the public atrium of Trump Tower for a couple hours while the NYPD went about arresting all 25 of us who remained (with our voices very hoarse from chanting). I feel very gratified to have put my body on the line and done my small part to take a public stand against this administration on the very day our president dropped the so-called “mother of all bombs” on Afghanistan (which I did not find out about until I was released from the ninth precinct around 10pm). You can read more about the action (and see footage of me getting dragged out of the lobby with a very unbecoming grin on my face) here. This entry was posted in Uncategorized on April 17, 2017 by rplatypus. My latest villanelle “Love in the Time of Trump” is up at The Rise Up Review. Enjoy! This entry was posted in Uncategorized on March 6, 2017 by rplatypus. My essay “Safari Lager and Swahili Hip-Hop” (excerpted from my unpublished travel memoir) is the weekly selection at The Forge Literary Magazine. They were also kind enough to interview me. This entry was posted in Uncategorized on January 16, 2017 by rplatypus. I passed through Dar es Salaam last month and filmed the music video for my latest Swahili hip-hop collaboration. Hope you enjoy. This entry was posted in Uncategorized on December 10, 2016 by rplatypus. I recently returned to New York from Dar es Salaam. While I was there, I made a Swahili hip-hop music video with some of my friends. This is what it looks like. This entry was posted in Uncategorized on March 9, 2015 by rplatypus. Today, the same day it was announced that the police officer who choked Eric Garner to death will not be indicted, my poem, “Pantoum Found in Eric Garner’s Last Words” went up on Entropy Magazine’s series of poems bearing witness to recent events of police brutality. I wrote it right after it happened back in July, and it’s saddening that it’s still relevant, that his command “this stops today” still hasn’t been heeded. The best way I could respond was by using the man’s own words; each of the lines are taken from the video (below) of his death. In much less maddening news, one of my poems “On Miracles” is being performed at Emotive Fruition next Tuesday, December 9, 7pm at Botanic Lab Bar on 86 Orchard Street. This entry was posted in Uncategorized on December 4, 2014 by rplatypus. Friends: This Sunday, October 26, 6pm I will be reading my creative nonfiction at the always-lovely Eagle & The Wren series. It takes place at Two Moon Cafe, 315 fourth ave in Park Slope. This entry was posted in Uncategorized on October 20, 2014 by rplatypus.